The Georgia State women’s golf team is finally budding players ready to breakout and become stars. Sophomore Harmanprit Kaur is one of those players along with incoming freshman Chloe Howard from Plymouth, England. Kaur is a native of Austell, Ga., where she got her start with the game at the age of 8. Golf runs in her family, and it’s just something she picked up from her dad and brother hitting golf balls in the backyard. From there Kaur took off and never looked back. She has played since starting as a junior amateur and continued her career throughout high school. One thing that has remained consistent is her play. When she was playing as a junior, she placed first at the Atlanta Junior Golf Championship. She has also been ranked as high as No.184 in the Golfweek national standings. Kaur just kept getting better and better as high school came around. During her high school career, Kaur once finished as the runner-up in the 2016 6-A state championship. She was also named to the All-Gwinnett County team three times. When Kaur got to Georgia State, she didn’t miss a beat. She instantly made her presence known as one of the best players in the conference. She was was named to the All-Sun Belt conference 2nd team, but to her, it was just her trying to perform at her best. Last season, she finished with an average of 75.88, which was good for 2nd on the team. Kaur finished in the top 25 six times and in the top 10 twice. She also finished seventh at the Sun Belt tournament. Kaur also did pretty well off the course. She has added an appearance on the Dean’s list and the Athletic Director’s Honor Roll. “I think I’m going to work on more confidence, kind of just going for it instead of being hesitant this year. I think that’ll be a big help,” Kaur said. Despite her success, Kaur knew there was more that she could do to improve her game, so she decided to make some changes during the offseason that she hopes will pay off. “I changed my swing a little bit. It’s helped me swing a little faster and hit the ball further, so that’s definitely a plus this semester,” Kaur said. Kaur is just one the Panthers’ three-headed monster along with Howard and junior Jemima Gregson. The entire team is improving, but these three are the team’s best players. They all push each other to be good players day in and day out. “It’s really helpful because we push each other to be better, and it’s just great because if you don’t have a good day, you know they’ll back you up…If you’re not having a good day, they’ll help you out,” Kaur said. “And I think the whole team is like that. Everyone just supports each other, and it’s great. It’s a good team dynamic”. So far this season the team has played in two tournaments with a few more left to go in the fall. The first tournament was the Paladin invitational at Furman University. Howard and fellow freshman Petra Duran led the team in their collegiate debuts. Howard shot seven over par and Duran shot 13 over and finished 52nd in the tournament. As a team, the Panthers finished the tournament 14th. In the second tournament, The Jacksonville class, the Panthers tied for 7th. Howard once again led the Panthers with a 12th place finish. Gregson finished the tournament 17-over par, which was good for 34th. 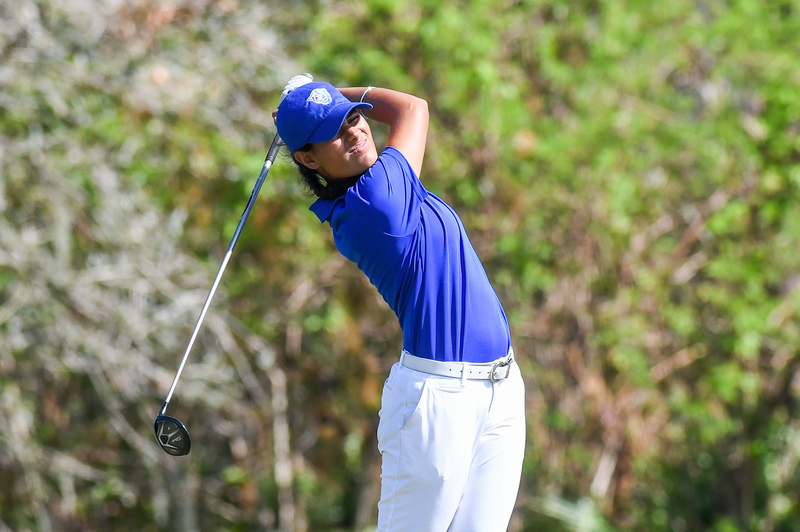 Kaur shot a 79 on the final day, and the tournament at 18-over par and tied for 40th. The Panther will participate in three more tournaments this fall and one during the winter, before they start their spring season in March.